A fortnight ago word came to Lytham casually that this soldier had been killed, but as he had warned his wife not to listen to rumours, she hoped on until Wednesday morning, when the official intimation came that he had died from exposure at the Dardanelles He had been very ill, was afterwards better, and then worse again. He was well-known as the left-handed bacon cutter at Seymour Mead's, before the introduction of machinery, and was always very courteous to customers. He married tthe maid at Mr. J. W. Hall's, Church Road, where she is still in service, and joined Kitchener's Army at the first recruiting meeting in the Pier Pavilion last year, being subsequently drafted to the King's Own Lancaster Regiment, and sent out to Gallipoli. He was 29 years of age. GOOD WISHES FOR 150th BRIGADE. The following letters have been forwarded to Col. Dixon, commanding the 150th Brigade R.F.A. (Blackburn Brigade), which was formerly stationed at St. Annes. E. Hamer, Town Hall, Blackburn." "I desire, on behalf of the citizens of Blackburn, to convey to your officers, N.C.O. 's and men in the Blackburn Brigade R.F. A., our good wishes and God speed on your departure for active service.—Alfred Nuttall, Mayor." Mr. Sam Wilson, who was one of the best known men in St. Annes, prior to his removal to Blackpool a few years ago, has a family of which he has just reason to be proud. His whole family of seven sons are on active service, and the fact is doubly interesting to St. Annes because of the fact that they are all natives of St. Annes. Mr. Wilson was, for quarter of a century, in business in an ironmonger's shop in St. Andrew's Road South, but was best known as a builder and contractor. He erected much residential property and the Carnegie Library at St. Annes, and he also built the Workhouse at Wesham. His workshop was behind West Crescent, and is now used by the Volunteer Training Corps as headquarters. Although only 55 years of age, Mr. Wilson had a long connection with the 2nd Manchester Volunteers, retiring with the rank of sergeant and the long service Medal. 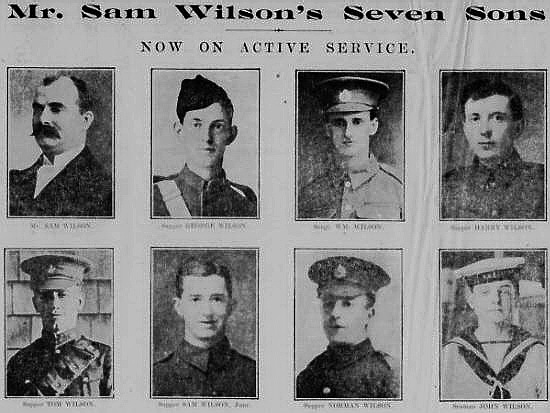 Six of Mr. Wilson’s sons are in the Army—all in the Royal Engineers—and one in the Navy. The second son, Sergt. W. Wilson, lives in Kilnhouse Lane, St. Annes. Two sons—George and William—are in the Dardanelles campaign, and the other two—Harry and Tom—were in Canada when war broke out, but they enlisted in the first Canadian contingent and are now in France. Sam, junr., is in France, and Norman is in training with the West Lancashire Territorial Engineers. The youngest, John, is on H.M.S. "Temeraire." All the seven took much interest in, St. Anne’s football, and Tom and Sam played for St. Annes Corinthians. The photographs are placed in order according to age. Children's toys are as plentiful this season as ever. Whilst those from Germany and Austria have disappeared, the toy industry in England has been trebled to meet the demand, and French and Japan have sent us large numbers of dolls and mechanical toys. A new doll, with real hair and a pleasant expression has been made by the British Red Cross. It is called an "Unconscious Exerciser," its arms being made of spiral springs, which expand and contract as the child uses them. From Lord Roberts' Memorial workshops have come battle toys and war games; and old-established firms, amongst other novelties, are filling snow men and snowballs with toys and making "lucky pies" from which toys can be abstracted by means of coloured tapes. The Japanese dolls are miniatures in dress and figure of the men and women of our Far Eastern ally. English industries have put on the market a series of nursery rhyme dolls, including Old Mother Hubbard and her dog, little Jack Horner and his pie, and little Miss Muffet and her spider. There are Teddy bears dressed as British officers, Belgian soldiers and French infantrymen, and all the notable men of the war have been reproduced as striking little figures standing 18in. high. Most of the large wooden toys, including motor-cars with bicycle pedals, have been made in England. From English firms also have come those large dolls' houses which are so conspicuous a feature of the great toy fair at Harrod's. Standing eight or nine feet high, children ran open their doors and enter, go upstairs and find a room for their reception on the first floor. All the Kindergarten toys puzzles, and bricks and cubes that used to come from Germany are now made in England. Some of the British-made boxes of wooden blocks contain masts and sails and all the necessary accessories for building yachts. Others have turrets, guns and flags, with instructions for building warships and fitting with special keel which enables them to float upright in water. One of the new British-made toys is certain to have a wide popularity with boys. It is the howitzer that fires a bursting shell. By means of a spring the shell "explodes" harmlessly immediately it strikes the object. There are also boxes of realistic models of guns, armoured trains and aeroplanes, torpedoes, soldiers in trenches, and so on, showing how our battles are fought. All these models fit into one another or stand firmly by themselves, so that on a dining-room table a child may make with them a fine battle array. Ireland, for the first time this year, has entered the domain of toys, and has sent across the Channel boxes of standardised and interchangeable blocks for building wooden houses, churches, castles, forts and bridges. There is, in fact, no end to the list of toys for Christmas. The only perceptible change at the big fairs is the absence of some of the cheaper sixpenny and shilling toys that used to be made in Germany. The English toy costs a little more, and is infinitely stronger and better.